Wildfires Blaze Across Parts Of Southwest The fires have shut down the San Juan National Forest and destroyed homes in the tourist hub of Moab, Utah. Flames and smoke billow skyward as a wildfire burns near Durango, Colo. on June 7, 2018. The 416 Fire continued to burn more than 27,000 acres Wednesday morning, causing the closure of a nearby national forest. Wildfires continue to scorch swaths of Colorado early Thursday while new blazes have destroyed homes in Utah and burned through Wyoming, at a time when Western states are experiencing acute drought. The Colorado blaze, known as the 416 Fire, began on June 1 near the city of Durango, which is near the state's southern border with New Mexico. The National Wildfire Coordinating Group said more than 1,000 people have been dispatched and close to 2,000 homes have been evacuated. Some evacuees were allowed to return home Wednesday afternoon, but they remained under orders to prepare to possibly leave again. Photographer Hank Blum posted to social media a timelapse of the fire and smoke billowing near Durango earlier this week. The fire and high fire conditions from exceptional drought have caused the closure of the San Juan National Forest, which covers 1.8 million acres. About 300 miles to the northeast, in an area known for its ski resorts, a fire in Silverthorne near Denver spread across 91 acres. Helicopters battled it with water pulled in from Lake Dillon, according to Colorado Public Radio. As of Wednesday night, no structures or human lives had been lost, county officials said. While the exact cause of the fire is unknown, officials said "Some type of human element is likely." In Utah, a brush fire destroyed eight homes in the tourist town of Moab, known for its red rocks. Police said their early investigation ruled out natural causes, according to the Associated Press. KUTV reporter Brónagh Tumulty‏ posted to Twitter a photo of the burned ruins of a home. 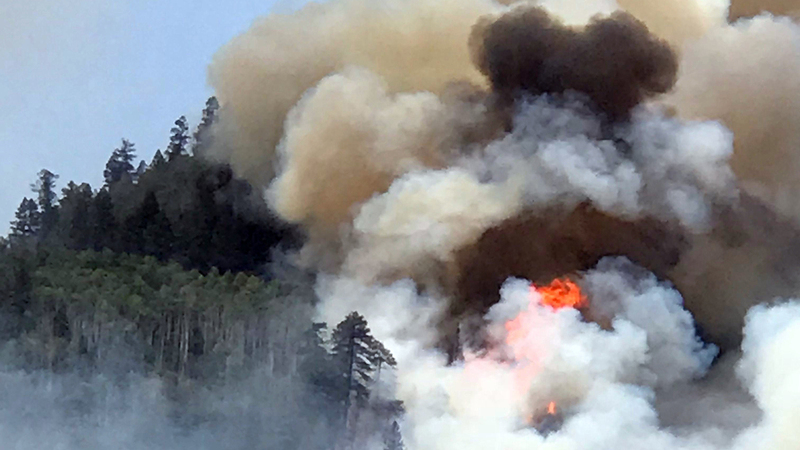 In Wyoming, the AP reports nearly 400 homes were evacuated after a wildfire near the Medicine Bow-Routt National Forest burned about 11 square miles. And in New Mexico, the Santa Fe National Forest remained closed because of "extreme fire danger." The 1.6 million-acre forest has been closed to the general public since June 1.